"The Golden Spike is Missing"
The Pacific Historian, 14 (1): 9-24, Winter, 1970. – Copyright 1970 by Robin Lampson. When President Lyndon Johnson appointed a commission to stage a national celebration of the centennial of the completion of the first transcontinental railroad, there seems to have been little or no hesitation in naming it "The Golden Spike Centennial Celebration." "The Golden Spike" is a phrase familiar to every literate person in the land; and the Golden Spike itself – the "Last Spike" used by California Governor Leland Stanford to complete the joining of the Central Pacific and Union Pacific Railroads at Promontory Summit, Utah, on May 10, 1869 – has become a historical symbol second only to the Liberty Bell. So, with the gravity of all this in mind, and completely serious, – I am compelled on the grounds of historical accuracy to declare, categorically and unreservedly, that the original Golden Last Spike is missing – that it has nowhere been in evidence during this past year of the Golden Spike Centennial Celebration! I am speaking of the original spike donated by David Hewes of San Francisco [see portrait photograph, left] to Leland Stanford for the May, 1869, event at Promontory. There is at present a gold spike on display in the Museum at Stanford University, and this spike was sent on loan to Promontory for the 1969 Centennial re-enactment, and was for a time on display in the foyer of the Visitors Center of the Golden Spike National Historic Site at Promontory, where it has since been replaced by a replica. I have examined the gold spike in the Stanford Museum. It is obviously NOT the original Hewes spike. I was at Promontory on May 10, 1969, and I made a second trip later to examine the replica on display there. It also was not an accurate replica of the Hewes spike. 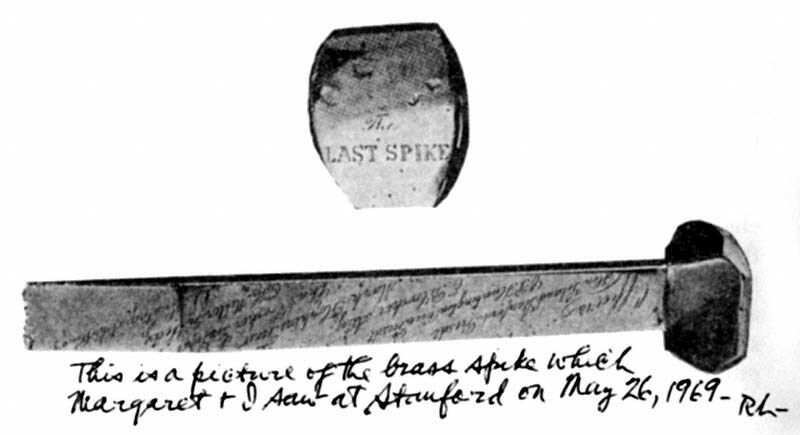 This is a serious charge, but evidently the Stanford gold spike (which most certainly would not have been made at all if the original Hewes spike were still available) was fashioned and engraved without recourse to photographs, and only from a written description, with the inscriptions either carelessly copied or inaccurately remembered. My own interest in the Golden Spike, or, as David Hewes' called it, "The Last Spike," dates back to my early childhood when I heard grandparents, parents, and aunts and uncles talk about it. A much deeper and more immediate concern with Hewes's Spike was most amazingly dropped right in my lap in November, 1937. At that time I was writing a series of 13 radio scripts, all stories out of Western history, which I read over Station KSFO in a program sponsored, appropriately, by the Wells Fargo Bank of San Francisco. One day the phone rang, and the caller told me that her great-uncle had been a prominent man in early San Francisco, and that she had inherited a trunkful of items from him, including books, pictures, and papers. Always on the lookout for another good radio story, I lost no time in checking on the contents of that trunk. I found it had once been the property of David Hewes, and had been left to his grandniece, Mrs. Henry (Mabel Warner Hewes) Chandler (deceased 1962) of Berkeley. It took only a few moments for me to realize that I had arrived at the home base of the Golden Spike, and I felt like a Forty-niner who had just driven his pick into a $10,000 nest of gold nuggets. About the third item that struck my eye was nothing less than the jewelers' receipted bill for "finishing" the Golden Spike itself. This receipt was dated San Francisco, May 4, 1869, and was made out to David Hewes – who, incidentally, had later become Leland Stanford's brother-in-law. A few moments later I came upon another, though unrelated, centennial "trifle" – the first checks, numbered 1 to 6, 10 to 12, etc., up to No. 336 (with a great many numbers missing along the way), written by the Regents of the University of California from August 11, 1868 – the year the university was founded – through June 1, 1870. One of these checks (No. 163, December 1, 1869) paid $24,600 for the original U. C.-Berkeley campus, and was signed by Governor H. H. Haight and countersigned by William C. Ralston of Bank of California and Palace Hotel fame. 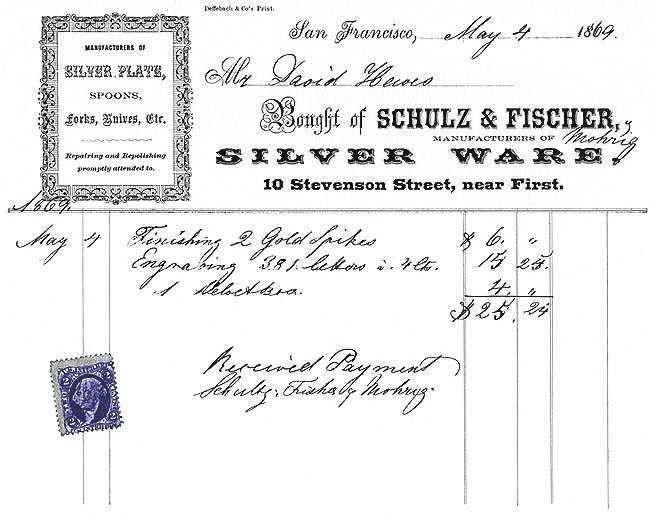 David Hewes is supposed to have rescued these checks from the San Francisco earthquake fire of April, 1906. Today they are cherished in a special box in the University of California archives. By this time, while delving through Hewes's trunk in November, 1937, I was convinced that this wealthy San Francisco contractor had associated freely with the leading Californians of his day. Next I found in the trunk two old photographs which I now believe to be the earliest and most precious Last Spike items in existence IF the original solid-gold spike itself has been permanently lost – or has been stolen and melted down for its gold. These large photographs, which had to be taken not later than May 4, 1869, but most likely in the latter part of April, show in clear detail two different views of the Hewes Golden Spike immediately after it was polished and engraved, but before the rough slug of excess gold from the "gate" of the founder's mould had been broken off and made into souvenir rings, etc., for Governor Stanford and his associates. Since Stanford, then president of the Central Pacific, left Sacramento with the spike the following day, May 5, 1869, on a special train headed for the rendezvous with history at Promontory, the finished Golden Last Spike could not have been carried from San Francisco to Sacramento later than the night of May 4 (by river boat). But newspaper reports state that the Golden Spike had been on display both in San Francisco and Sacramento, so that it probably arrived in the state capital at least a day or two earlier – unless it was on display there only a few hours. Further down in the Hewes trunk (in Berkeley in 1937) I found a thick, heavy volume that soon told me many of the things I was eager to find out about David Hewes and his gift of the Golden Spike. The book's title was Lieutenant Joshua Hewes, a New England Pioneer, edited by Eben Putnam, and privately printed for David Hewes by the Tapley Co., New York, 1913. This largely genealogical book contains an "Autobiography" by Golden Spike donor David Hewes which includes an illustration of prime historical significance: opposite page 250 there is a full- page halftone picture showing five different horizontal views of the spike and, quite clearly, the inscriptions on the four sides and – of great importance – their sequence. This halftone illustration is quite clearly, simply, magnificently, and unequivocally captioned "THE GOLDEN SPIKE WHICH UNITED THE CENTRAL PACIFIC AND UNION PACIFIC RAILROADS": it is so designated by the one human authority whose word cannot reasonably be questioned or doubted – David Hewes, the man who conceived the idea of "The Last Spike," put up the gold and the cash to have it made, composed or chose the inscriptions engraved on it, and proudly donated it, along with the polished "Last Tie" of California laurel which he states he also had made and presented for the occasion, to mark a triumphant milestone in our Nation's history. The two old photographs were presented to me by Mrs. Mabel Hewes Chandler in appreciation of the radio script I wrote about her great-uncle and read over Station KSFO. These two photographs have, in fulfillment of a longtime promise to an old friend, Allan Ottley, California Section Librarian, just been donated to our State Library in Sacramento. Along with the five smaller views in the book, these two large photographs have given me an almost unequaled opportunity to become familiar with every detail of the original golden Last Spike. As a matter of fact, either of my two large photographs provides sufficient proof that the gold spike at present in the Stanford Museum, – the same gold spike that was furnished on loan by Stanford University for the official Golden Spike Centennial Celebration ceremonies last May 10 at Promontory, – is definitely NOT the original Golden Spike donated by David Hewes to Governor Stanford and featured as "The Last Spike" at Promontory Summit on May 10, 1869! Consequently, all the various publicity glossy-print photographs supplied to newspapers (with two exceptions) and to magazines and various authors of books during this centennial period have emanated from the Stanford University archives and are pictures of at least three (one gold, two base metal) spurious spikes. The Stanford gold spike is a slipshod, inaccurate attempt to duplicate the authentic Hewes spike, and is patently engraved from a carelessly copied written account of the inscriptions on the original spike, probably from a contemporary newspaper clipping. To compound confusion (and confound the student), the inscriptions on Stanford's two base-metal duplicate spikes do not agree in sequence or lettering either with each other or with the Stanford gold spike! (The "two exceptions" mentioned above were of my two old photographs from the Hewes trunk which were shown in a five- column spread in the "New Vistas" weekend magazine of the Berkeley Daily Gazette and the Richmond Independent on May 11, 1968, and again as part of a front-page banner-headline story, "STRANGE STORY OF MISSING GOLDEN SPIKE," in the Richmond Independent of June 4, 1969). Unfortunately, Stanford's three differing publicity pictures have been widely published throughout the country and even internationally. In fact, one scholarly magazine, the Utah Historical Quarterly, in its Winter 1969 issue presents pictures of two obviously different "last spikes" – one, on page 80, is of one of the brass spikes at Stanford, with the list of Central Pacific "Officers" on the back of the spike; the other, on page 144, is of Stanford's gold spike, with the "Officers" list on the front. The magazine's credit line says "Photographs of original spike furnished by Stanford University." So here we are confronted with two different "originals" of a single historical artifact! To complicate the situation still further, this issue of the Utah Historical Quarterly, which bears the cover title of "The Last Spike is Driven," is also labeled on the cover as the "National Golden Spike Centennial Commission Official Publication" – which would seem to give official sanction to these erroneous photographs! Clear, easily legible prints of the third variety of "original Golden Spike" publicity pictures supplied by Stanford are found in what is otherwise one of the very finest Centennial books, Gerald M. Best's Iron Horses to Promontory, (Golden Spike Edition, Golden West Books, San Marino, California, 1969.) I salute Mr. Best for his profound knowledge of locomotives and railroad history; but I can only feel limply sad, when, on page 58 of his most entertaining book, I am confronted by five views of an inaccurate brass duplicate erroneously captioned "The Golden Spike." It is not necessary to state that I am sure Mr. Best used these pictures in all good faith, trusting them to be as represented. The sad, sad, sad fact is that all this regrettable mix-up about the authentic Golden Spike, this strange case of mistaken identity, could have been avoided, and with far less effort than it took to produce all this confusion. The first notice of the impending Golden Spike Centennial Celebration to catch my attention came with a rather belated reading of the exciting two-page center-spread article in the August, 1968, Southern Pacific Bulletin. It reported that ground had been broken on August 14 for the Golden Spike National Historic Site at Promontory, Utah, this site having become part of the National Park System by a recent Act of Congress. The article added that the main structure at the historic site would be a $180,000 Visitors Center, including a library, museum, and a small auditorium; and it stated, "Altogether, about $400,000 has been earmarked for development of the area. . . . The site will also feature a reconstruction of the 'original gold spike scene,' including track, telegraph lines, and two locomotives closely resembling the Central Pacific Jupiter and the Union Pacific No. 119." I also learned that President Johnson had appointed a 13-member Golden Spike Centennial Celebration Commission headed by Thomas M. Goodfellow, president of the Association of American Railroads. So, on September 25, 1968, I wrote to Mr. Goodfellow, in Washington, D. C., sending him a copy of my above-mentioned "New Vistas" article of May 11, 1968, featuring the large clear prints of my two old photos of the genuine Hewes spike. I also offered (and soon after sent to the Commission's Ogden office) a copy of the May, 1940, issue of The California Monthly (University of California Alumni Association magazine) in which I told the story of David Hewes and his gift of the golden "Last Spike." This article, on slick paper, included large fine-screen prints of my two old photos of the Hewes spike with the inscriptions easily legible. Two days later, on September 27, I wrote a similar letter to George B. Hartzog, Jr., Director of the National Park Service, also in Washington, D. C., with the same inclosure and offer. I received prompt, courteous, even enthusiastic replies – in each case the letter running onto a second page – from both the Centennial Commission and the Park Service. They each thanked me for my printed contributions and offers of informational help, – but evidently my very special material was either not carefully considered or simply filed away. However, we – my wife and I – were sent a beautifully engraved invitation to the Golden Spike Centennial Celebration, with complimentary tickets to all the events selected, including the "Guests of Honor" Banquet in Salt Lake City on the evening of May 10, following the Centennial re-enactment ceremonies at Promontory. We were fascinated by the re-enactment, and (in spite of the discomfort resulting from a minor operation on my left ear on May 8) enjoyed the hospitality of Utah. But for us there was a saddening facet to the whole Celebration because the National Treasure after which the very Centennial was named – the original Golden Spike – was nowhere to be seen, and a "phony" spike, albeit of gold, was masquerading as the genuine one in the Visitors Center. One of the goals of the development plan for the Golden Spike Historic Site, according to F. A. Ketterson, Jr., historian of the National Park Service responsible for the restoration of the Site and the authentication of its historic displays, was the recreation, as near as possible, of the historic scene of May 10, 1869, at Promontory Summit. "There were a number of differences in the engravings of the loaned spike and the Hewes spike. Therefore, the laboratory used photographs of the Hewes spike as their guide for engraving the spike. The result is a very good duplicate of the Hewes spike." 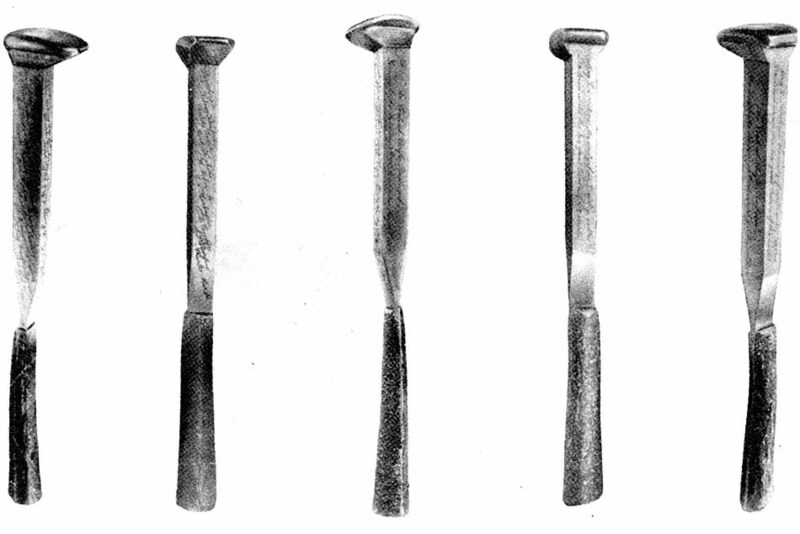 The panel of five different views of the original Golden Spike, shown opposite page 250 in the Putnam book (published 1913). Prime evidence, as Hewes here identifies this as the "Last Spike" used at Promontory, 1869. The five views also show the sequence and wording of the inscriptions. However, when we visited Promontory a second time on May 29, 1969, hoping to see this "very good duplicate," we found it all too similar to the inacurrate "duplicate" at Stanford. It may indeed have been the Stanford gold "duplicate," not yet returned to the university. I asked the two attendants on duty about this, but they could give us no information. 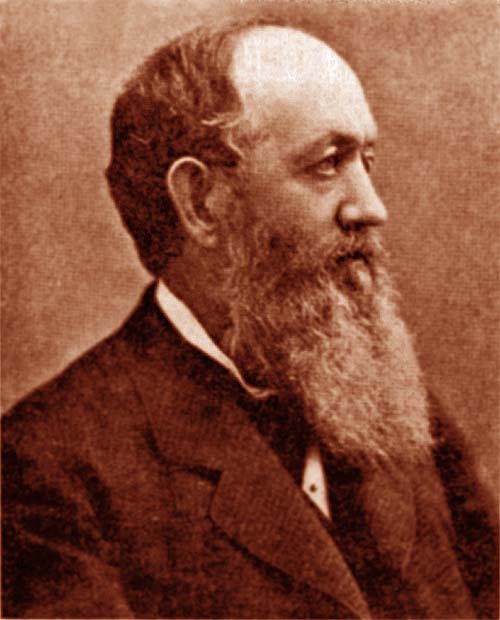 Mr. William T. Krueger, superintendent of the Site, had already left for the Memorial Day weekend, and we could not wait in Ogden three days to see him. After our return home I wrote an inquiry to Mr. Ketterson, but never received a reply. May 10, 1869 – After the ceremony at Promontory Leland Stanford is reported to have reached down and lifted the spike from its hole and then dropped it casually into the side pocket of his coat. Later he ran into David Hewes and handed him the spike, no doubt saying something like, "Here, Dave, you keep this. I don't need it." Hewes took it, and kept it until 1892, when he donated it, along with his quite valuable art collection, to the newly-opened Stanford Museum. The paintings included one each by DaVinci, del Sarto, Perugino, Tintoretto, Cellini, Rubens, Van Dyke, Fra Angelico, and Michelangelo, and four by Raphael – a galaxy that quite outshone the little gold spike which cost Hewes $425.24 all told. Incidentally, we should note here that Stanford University had just first opened its doors to students October 1, 1891. 1892-1936 – For 44 years we hear precious little, practically nothing, of the Golden Spike's being on exhibit in the Stanford Museum. During the periods I myself was a student at Stanford, from 1919 to 1924 (with over a year out for service in Soviet Russia with Hoover's American Relief Administration,) I do not remember once visiting the Museum, or hearing anyone, student or faculty, recommend such a visit, or hearing or reading that the Golden Spike was on display there – which would certainly have impelled me to go see it. The Museum itself was from the first a stepchild of the University, unwanted, unwelcomed, unused. The Stanford son, Leland, Jr., dead at 16 of typhoid in Italy (1884), had wanted to found a great museum in California; and instead of squandering on idle pleasures the lavish allowance of a very rich man's only child, the boy spent it remarkably well on a wide range of "objects of art and curiosity" to fill that museum. Though the Leland Stanford Junior University itself is a memorial to the dead boy, the parents, and especially the mother after the father's death in 1893, lavished on the Museum buildings hundreds of thousands of dollars which President Jordan, his administrative staff and the faculty felt were more needed and better spent for more classrooms, faculty, books and equipment. All the histories of the early years of Stanford University which I have read – by Dr. Jordan, O. L. Elliott, J. Pearce Mitchell, and Edith R. Mirrielees, to name but a few of the best – repeatedly stress this feeling and judgment, but not without deep sympathy for the Stanfords and appreciation of their magnificent generosity. After all, they could have spent their great fortune on themselves, or left the remainder of it to relatives – but instead, they gave over $40 million to found a great university, and, what is more, they both gave the last years of their lives, with almost inspired devotion, to helping President Jordan bring it into being. . . . All this about the Stanfords and their Museum may seem like a digression from our story of the missing Hewes spike. But I assure you that it is relevant, and that in due time its significance and importance will be apparent. 1936 – Suddenly, after 44 years of oblivion for the Golden Spike at Stanford, the newspapers announce that, for security reasons, the spike has been transferred to the vault of the Wells Fargo Bank in San Francisco for safekeeping. This would imply that the Stanford authorities felt that their Museum was no longer a safe place for so famous and so valuable a historical relic. After all, hadn't President Roosevelt raised the price of gold from $16 to $35 an ounce in 1933, thus lifting the intrinsic value of the gold in the spike from about $226 to $495? However, the public is given no further explanation. 1954, November 1 – After 18 years, Stanford considers its Museum again a safe place for its Golden Spike, which is returned by the Wells Fargo Bank to the university. – At this point one thing should be made unmistakably clear: the gold spike which the bank returned to Stanford on this date was unquestionably the identical spike which the bank had received from Stanford in 1936. Mr. Ralph W. Hansen, Stanford University's Archivist, confirmed this fact when my wife and I visited his office on May 26, 1969. However, the inevitable logic of this – since the gold spike now on hand at Stanford is NOT the original Hewes Golden Spike – is that the substitute gold spike was created BEFORE it was sent up to the Wells Fargo Bank by Stanford in 1936. It is at this juncture in this true mystery story that we arrive at its most fascinating puzzle: At what point in that long 44-year period was it discovered, and by whom at Stanford, that the original Hewes golden Last Spike was missing? Was it lost, misplaced, or stolen? Scores of pertinent questions leap into one's mind (I have put myself to sleep more than one night counting the possibilities! ): Had the spike been stored away somewhere, eluding all search for it? Had some special occasion arisen where the university wanted to show or display the spike, and could not find it – and so had had a substitute hurriedly, quietly, and inaccurately made? Or was only an individual, and not the university administration involved – and did that person, to save his job, or protect a relative or a friend, or to shield the university from a scandal, have the substitute spike quickly and carelessly made from a written description rather than from photographs? Did such a situation face a professor, perhaps, who surprised his son or a nephew in the act of melting down the original spike in the Chemistry lab? But before we ask any more such questions, let us first dispose of one suggestion that was first made several months ago: Did David Hewes possibly lose his original spike and have a shoddy, careless "duplicate" made which he presented to Stanford's Museum in 1892? I can only answer that I have made a thorough study of David Hewes's life and record, and I am convinced that he was too honest and forthright a man to try to foist a substitute Last Spike on the public. If he had lost the original, and had had a substitute made, he would have said so quite frankly – and, moreover, he would have had an accurate replica made, one practically indistinguishable from the original. And up to the time his "Autobiography" was published in 1913 (two years before his death), David Hewes was the only person who had the original photographs necessary for making an exact replica. ... As Dr. James D. Sleeper, that indefatigable and entertaining Southern California historian, [recently] wrote me, there was nothing underhanded or slipshod about David Hewes! Incidentally, while visiting with Mr. Hansen in the Stanford Archives rooms, I was pleased to see on the wall the framed receipted bill of the jewelers for "finishing" the original Golden Spike – the very document which I had uncovered in David Hewes's trunk over 31 years previously. Now I am able to report a new discovery: I had always wondered why the jewelers had billed Hewes's for "finishing" the spike rather than for "making" it. Late in 1969 I learned that the mould for the spike was actually made by William T. Garratt, brass and bell founder of San Francisco, who also cast the spike, which was then turned over to Schulz, Fisher & Mohrig for the finishing. I believe this is the first time in this century that the "Garratt/spike" information has been in print. But back to our spike chronology. There are at least two likely important dates when Stanford might have wished, or been called on, to exhibit the Golden Spike: 1. In 1915, at the Panama Pacific International Exposition in San Francisco; 2. In 1919, at the 50th Anniversary Celebration at Promontory. However, thus far a quite considerable research on my part has failed to reveal any mention of the original Golden Spike being displayed or used at either of these events. I have checked the Annual Reports of the President of Stanford University, and all the standard library books about the 1915 Exposition, to no avail; but I have not had time to scan through the 1915 San Francisco newspapers, or the 1919 Salt Lake City and Ogden newspapers. I would greatly appreciate hearing from anyone who has definite knowledge of this matter, with source references. But the logic of all the considerations involved tells me that when the Stanford authorities (either for one of the events or possibilities mentioned above, or for any other purpose or reason including simple curiosity) tried to lay their hands on the Golden Spike, it was nowhere to be found – all because of another tremendous date that intervened between 1892 and 1915, namely April 18, 1906. The destruction wrought at Stanford by the great earthquake in less than a minute that April morning has been thoroughly studied and comprehensively chronicled. President Jordan, in his monumental autobiography The Days of a Man (1922), sums it up with aphoristic brevity: "$2,500,000 worth of academic property had been destroyed, all in the brief space of 56 seconds." We should turn back to explain that Mrs. Stanford's pet Museum, the first structure of which architecturally reproduced the Museum at Athens, Greece, had by 1900 been added to with "a series of two-story wings that passed around from either side, and meeting behind, enclosed a quadrangular court." Dr. Jordan states that the original building, being of reinforced concrete, escaped serious injury, though the collections were promiscuously rattled about, "like peas in a gourd," and many things irreparably smashed; but the extensive additional buildings were "an apparently hopeless wreck!" Photographs show them as little more than long heaps of rubble. Both O. L. Elliott, Stanford's first Registrar, in his book Stanford University, the First Twenty-five Years, and English Professor Edith R. Mirrielees, in her volume Stanford, the Story of a University, indicate that looting began the very day of the earthquake. Miss Mirrielees writes, "Not all those warned respected the warnings. Ruins had to be roped off as soon as ropes could be found, guards set to prevent the curious from making their way in. Even ropes and guards were not always effective." She also states, "The Museum smoked with a fine dust that screened the damage done," and adds that the crowds grew "by the hour as those from Palo Alto and Mayfield and the nearer ranches came to assess the damage." Dr. Mirrieless herself further "assesses the damage" in the Museum thus: "Many of the objects were destroyed in the earthquake and fire. [Italics mine. – R.L.] Others were huddled into the rooms least damaged. Still others went to whatever storage place could be found. The Museum itself stood closed for years." That "and fire" puzzles me, for it is the one and only mention of fire in connection with the earthquake at Stanford that I have noted in all my voluminous reading on the subject. But, as a Stanford student, I knew Dr. Mirrielees well. She was an excellent English teacher, and anything but a sloppy-minded person. She was there that day, she saw what happened, and she would have abhorred any slip of the pen. So I take it that a fire did break out in the Museum ruins; but it could not have been a very big one, or we would have heard a lot more about it. Thus, immediately after the earthquake at Stanford, we find the stage perfectly set for the disappearance of the original Golden Spike. In accord with this, as intimated earlier, the period from the earthquake in 1806 up to the publication of the Putnam-Hewes book in 1913 is the most logical time for the disappearance of the original spike, for the loss to have been discovered, and for the inaccurate substitute to have been made by a person or persons interested in keeping the matter secret and possibly unwilling to consult the one authority, David Hewes, if indeed they knew of him or realized that he was still alive. Furthermore, until more information is vouchsafed the public, either by the Stanford Archives if indeed they have it, or by the Stanford authorities from their inner-sanctum files of letters, accounts, or other records, if they contain anything pertinent, this working hypothesis is based on the best knowledge and logic I command, plus a sincere interest in historical accuracy, and a reverent concern for the authenticity of a great National Treasure. Never before in the history of our country has a simple object like a railroad spike so captured the popular imagination and won universal recognition as a symbol. For over a century now the Golden Spike has represented the magnificent feat of connecting the West with the East, the Pacific with the Atlantic, by rail. The Golden Spike joined our Nation together at a time when it needed it most – just after it had been nearly broken in two by a great Civil War. Hence, the true, genuine, original Golden Spike is a National Treasure to be cherished, preserved, and protected. Unfortunately, this has not been done. The original Golden Spike – the Hewes "Last Spike" – is missing: those persons responsible for it, who thought they had it in their keeping, have been unable to find it, and – most remarkable – it seems almost impossible to point a finger of blame at any living person. But, instead of defending an honest, unintentional mistake and trying or hoping to "get by" with a rank substitution, those involved should make every effort humanly possible to find the original spike – or, failing that, see that the spurious spike is melted down and the gold fashioned into a faithful replica of the original. Just think! – this could have been accomplished well before May 10, 1969, with those photographs from the Hewes trunk and only one of those four hundred $1,000 bills appropriated to celebrate the Golden Spike Centennial! Note; The sequence of the following inscriptions on the four long sides is NOT the same on the two spikes. The sequence on the Hewes spike is followed here, – but we juxtapose the corresponding inscriptions of the Stanford spike, to make comparison easier. Hewes: (in two parallel horizontal lines) May God continue the unity of our Country, as this – Railroad unites the two great Oceans of the world. Hewes: The Central Pacific Railroad, – Ground broke January 8th, 1863, completed May 8th, 1869. Hewes: (in nine diagonally-rising lines; "Directors" only in quotes): "Directors" – Hon. Leland Stanford – Charles Crocker - Mark Hopkins - E. H. Miller, Jr. - C. P. Huntington - E. B. Crocker – A. P. Stanford – Charles Marsh. In addition to all these differences, the engraving on the Hewes Golden Spike is much more expertly and neatly done, with uniform lettering throughout. The engraving on the Stanford gold spike is less controlled, with amateurish flourishes and varied styles of letters. Lampson, Robin (1970) The Golden Spike is Missing. The Pacific Historian, v.14 n.1, p.9-24. Courtesy Michael Wurtz, Archivist, Holt-Atherton Special Collections University of the Pacific Libraries. Reproduced by permission. With additional thanks to Shan Sutton, Dr. Al Clover,Hesperia Press, and Kyle K. Wyatt, Curator of History & Technology, California State Railroad Museum. Also see: The lost spike has been found!! !